All About Barrhead | Barrhead Rainbow Run’s Inclusive Race! 18 May Barrhead Rainbow Run’s Inclusive Race! 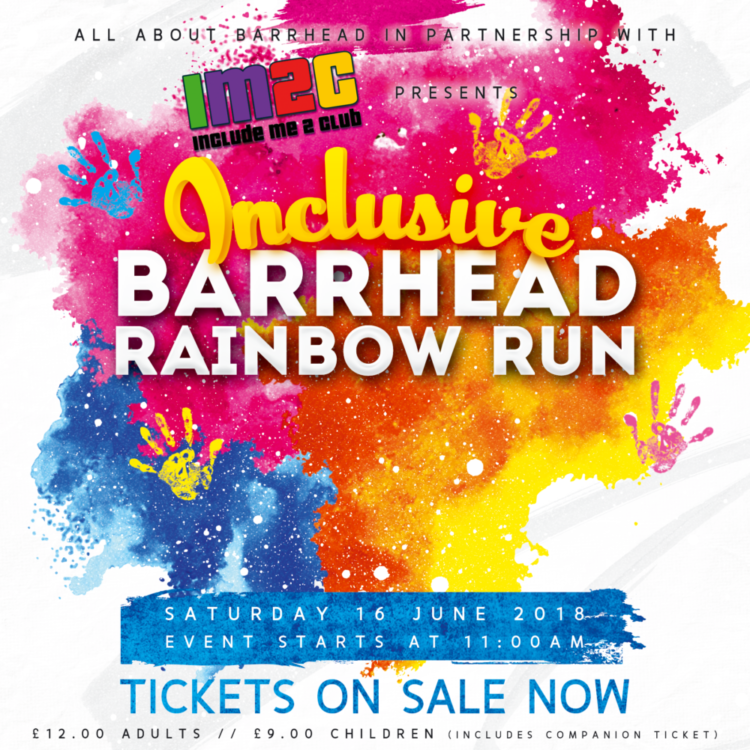 We are excited to announce that this year’s Barrhead Rainbow Run will be hosting an inclusive race in partnership with Include Me 2 Club! The race will begin at 11am and will be inclusive of a number of additional support needs and requirements. Limit the number of participants, with staggered starting times. Modify the route, providing alternative paths around obstacles if needed. Reduce the volume of the announcements and music from the stage. Provide seated break points throughout the route. Facilitate a quiet space away from the main event. Provide additional support at key points throughout the route. The ticket will admit one person plus a companion and both will receive an event day t-shirt, paint packet, medal and goodie bag. This time slot is to ensure that those with additional support needs can enjoy the Barrhead Rainbow Run to its fullest potential. Limited support and assistance will, however be available at all time slots throughout the day, please email colette@allaboutbarrhead.co.uk to discuss any additional requirements prior to purchase. In the coming weeks we will be sharing a 360 Tour of the route on Facebook through the all about Barrhead page and the Barrhead Rainbow Run event page. In the meantime you can see pictures and videos from last year’s event on our Facebook page.